Machine construction includes project elaboration (layout) and construction of various modules, which are the foundation of certain production systems. The systematic approach – modular concept, level distribution and interconnectivity, are the policies that we pursuit. Our projects are realized with the use of equipment sets of world renowned manufacturers and our own applications. Based on joint project documentation and equipment selection, the selected components and applications are specifically adjusted to fit the customer’s needs. The automation of the production equipment is upgraded with computerized control systems, which are connected into networks on different levels. The information systems are used for controlling and monitoring the work processes. L’MIS software is used for managing and documenting the implementation of projects. This software tool, which we developed ourselves, is designed to be the most flexible, easy to use and effective project-managing software. Based on close collaboration with partners and clients, we design and develop new cutting-edge technologies. Also, existing technologies are constantly adapted, upgraded and improved to fit the most demanding requirements. We modernize various production systems and equipment, CNC processing tools and systems, assembly lines, transportation systems, etc. To ensure the best possible results, the planned systems are modeled and optimized before implementation. All major parameters can be inspected to ensure flawless production processes. The results can be displayed in various numerical or graphical formats. Scale versions of the finished production systems are used to check the production flow throughout the entire system. Each production step is checked separately to ensure a uniform workflow. 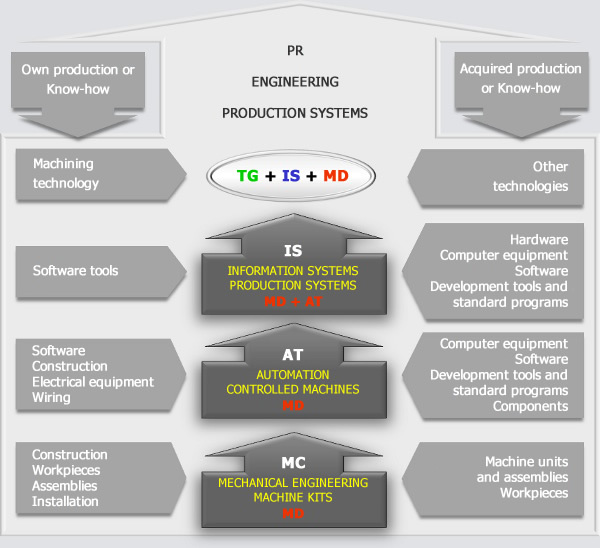 Promodel is a simulation tool, which offers a computerized version of the production system. The simulation can be sped up, to predict long-term production rate and workflow. This valuable information is used for selecting the optimal solution and to prevent future disadvantages.